Finally it’s here! 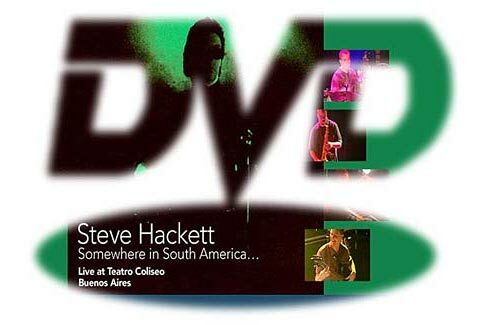 The long-awaited DVD with Steve’s concert in Buenos Aires’ Teatro Coliseo on July 01, 2001 has arrived. It comes in a black foldout box with two audio CDs of the same concert as a bonus. The DVD and the CDs both contain the complete 104 minute show; the DVD additionally has a 15-minute bonus feature about the tour through Italy where the band performed in summer 2000. It gives us glimpses of the soundchecks and short interviews with the members of the band about the good collaboration with Hackett, who since that tour has been touring with the band we get to see here, too: Roger King on the keyboards, Gary O’Toole on the drums, Terry Gregory on bass, while Rob Townsend plays the saxophone and the flute. In his diary of the South American tour Roger King mentions that the soundcheck for this gig was good. He also notes that the audience was very attentive, but that the performance was bit stiff, perhaps because the show was being reocrded. Steve is said to have been very pleased with the show, but Roger thinks he could have played better. The Teatro Coliseo is not really the place for a wild rock n’roll show. It is very posh and offers seating only. The audience therefore applauds appreciatively, but it does not break out into storms of applause with whistling and what else. This DVD presents new songs like Mechanical Bride and Serpentine Song that were first played in 2000. Other new pieces like Pollution and Lucridus could best be described as intros with wild effects to the songs that follow them. Steve does not forget his past. We get to hear classics like Firth Of Fifth and Los Endos. Hairless Heart is another piece from “the good old times” and it does not sound a jot worse than then. This is a well-adjusted band that easily puts into action Steve’s ideas of a live interpretation. It is a bit regrettable that Hackett hardly makes any announcements between songs, so that his communication with the audience seems to be minimal. Unfortunately, Shadow Of The Hierophant and In That Quiet Earth were not performed though they were played on other nights of the tour. There had been technical difficulties leading up to the release of this DVD. Apparently it was not easy to obtain the complete sound and video recordings in pristine quality from the Argentine TV. What we get to see is, all in all, a professional production with lots of camera booms and 5.1 Dolby Digital Sound on DVD. The sound is mixed in a way that brings out every musician, even the bass. The rear speakers in surround sound are only used for audience feedback and echoes, so that, acoustically, one is standing in front of the stage instead of on the stage, but that is a matter of taste. The image quality could have been better; one cannot help the impression that the film material came from a VHS copy rather than a professional master tape. Worse still, there are loud scratching noises on the right frontal speaker in 5.1 sound (just like a badly copied CD-R). This is most annoying during the acoustic Walking Away From Rainbows where it peaks two times in a row. Since these flaws do neither appear in the stereo mix on DVD nor on the audio CDs there must have been a flaw in the 5.1 mastering. A pity that that was not corrected. 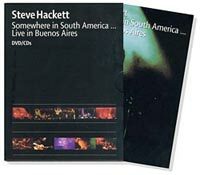 All in all, this DVD+CD box is well worth acquiring for every fan of Steve Hackett. With it, one can trace Hackett’s musical development after the 1996 Tokyo Tapes very nicely indeed.